The objective of the challenge is simple. Build a spacecraft, carry some tourists into orbit, then bring them home safely, as cheaply as possible. Both SSTO's and disposable rockets will be considered separately. 1. 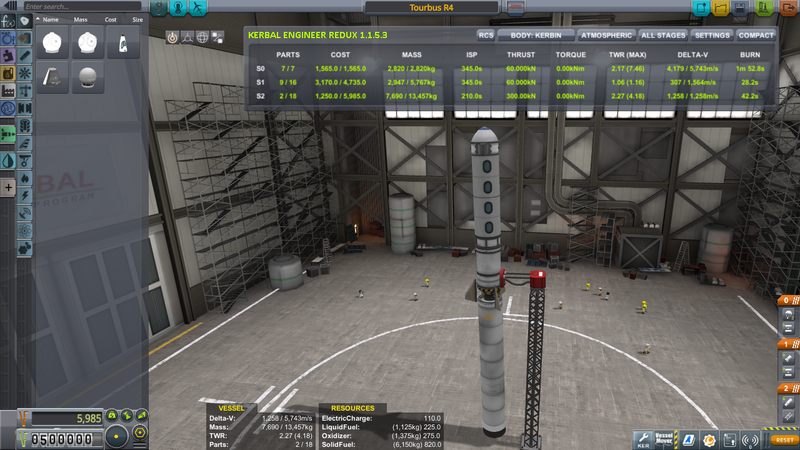 Stock only, except possibly visual and informational mods, with reentry heat set to 1, commnet enabled, extra ground stations enabled, plasma blackout enabled, and atmospheric osculation set to 1. 2. No excessive part clipping. 3. 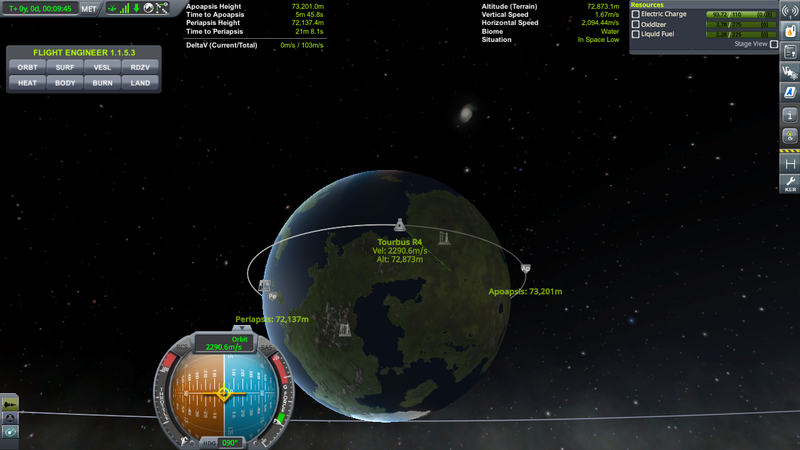 Orbit means PE greater than 70km. 4. Both the crew and the passengers must be carried in command pods or crew cabins. The craft may be remotely controlled. 5. You must demonstrate your entry with a mission report and pictures or videos. A1. 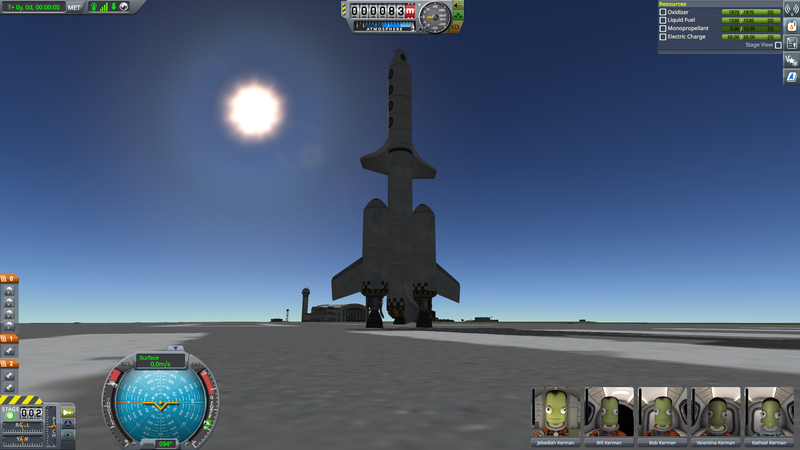 Craft must takeoff from the KSC launch pad. A2. Craft must only uses tier 5 (90 points) or below parts, and have no more then 30 parts. Because sophisticated crafts are expensive. A3. For safety, if the craft relies on parachutes for landing, it must be able to safely open its parachutes at or above 6000m. A4. Cost = Wet cost / number of passenger. We don't consider recycling parts. A5. Caveman bonus: -10% cost it the craft only uses tier 4 (45 points) or below parts. A1. 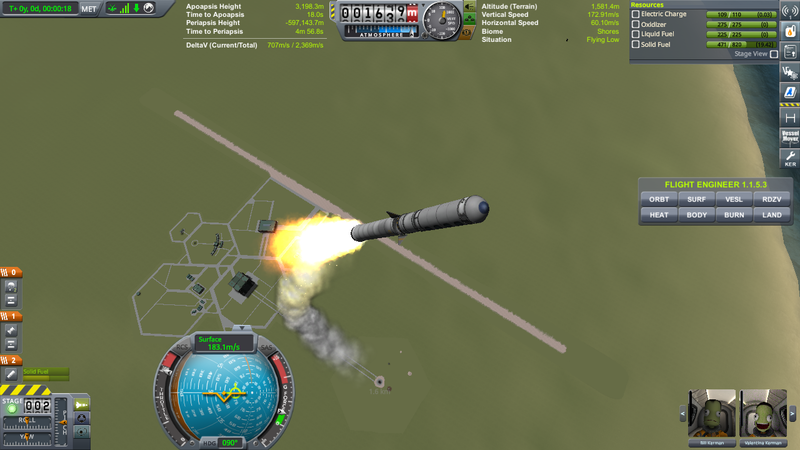 Craft must takeoff from the KSC launch pad or runway, and must realibly make controlled landing back to the KSC launch pad or runway (spamming quicksave and pray is not considered reliable, for example). A2. No part can be dropped or destroyed throughout the flight. In particular fairings cannot be staged. A3. Craft must only uses tier 6 (160 points) or below parts. A4. Cost = (Wet cost - 0.9* Dry cost) / number of passenger. i.e. we assume 10% airframe depreciation for each flight. This simulates the maintenance cost of the SSTO. A5. Caveman bonus: -10% cost it the craft only uses tier 5 (90 points) or below parts and have no more than 30 parts. Does this mean full deployment at 6 km, or is semi-deployment enough? And do drogue chutes count? And is it OK to open just some chutes (maybe just the drogues?) at 6 km, and others further down? Also, does this rule also apply in the SSTO category, or is it OK to play chicken with the surface there? Semi-deployment or drogue is fine. This guarantees you slow down in time. What is bad is you have to pray your parachute opening in the last second or you slam into a mountain. Note that in both cases if your craft doesn't rely on parachutes the rule doesn't apply, but for an SSTO you need a better way to control your landing in order to qualify. Extra ground stations enabled seems like an odd one. I have them disabled, why does that make a difference in regards to the challenge? 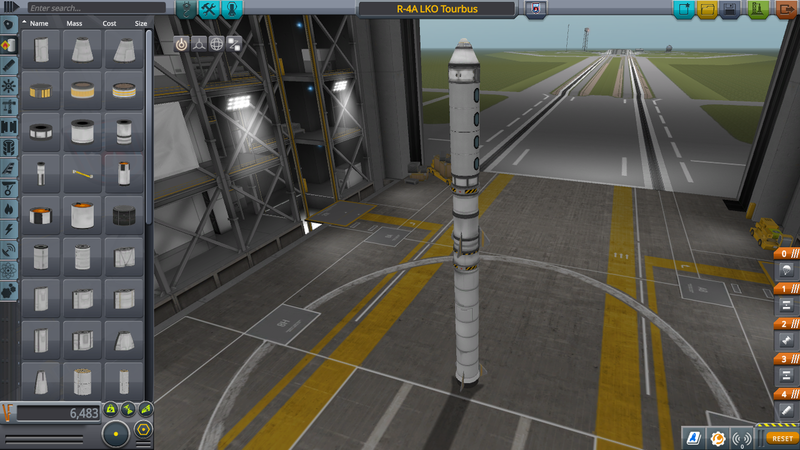 Also atmo occlusion is set to like .90 for vacuum bodies and .75 for atmospheric bodies by default. Requiring a change to it is pretty weird, especially since the default setting is fairly realistic if you account for signals bouncing off the atmo/diffraction. I think you'll get more entries if you don't disallow the default stock settings? What about extra ground stations enabled? That makes it easier, not harder. But hey, it's your challenge. Good luck finding people who play with those exact settings. ok I don't know what settings is the best. Btw these settings can be changed midgame. If it were me; I would allow any setting, but award more points for harder settings. That way you'll get more participants. A2. Craft must only uses tier 5 (90 points) or below parts, and have no more then 30 parts. ﻿ Because sophisticated crafts are expensive. Not necessarily expensive: my PassengerRocket1 uses a few tier 6-8 parts, and 78 parts in total... but the per-passenger cost is very cheap ( 204.08 in the one challenge attempt, just the fuel and recovery cost) and remained unbeaten in a previous cheap passenger SSTO challenge. Even the total cost is pretty low ( 65350 for 64 kerbals to orbit and back). With a few small changes it could be limited to tier 6 parts (it does need a probe core capable of pro/retro SAS) and go down to 63520 total. A few trial runs to tune fuel for 71km LKO and an exact deorbit burn (there is a bit of excess fuel), and per passenger cost could go below 143.44 (assuming 100% recovery). A4. Cost = (Wet cost - 0.9* Dry cost) / number of passenger. i.e. we assume 10% airframe depreciation for each flight. That's a pretty harsh depreciation for a recovery. 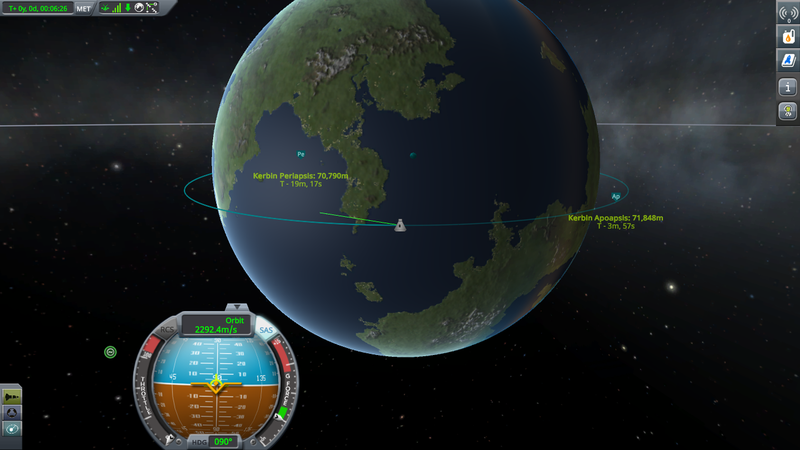 The stock game doesn't depreciate that much even when the craft lands half-way between KSC and the mountains (96.4% for the challenge attempt). Anyway, obviously your rules are quite specific and not exactly default, so my rocket will not be a valid entry. It can serve as example of how low things can go. Good luck with your challenge, should be interesting to see what entries come in. OK. Since everyone play normal, I change the settings requirement so that anyone playing normal settings automatically qualifies. But to use any part above tier 5 you need to upgrade the R&D building, which IS very expensive. The tech requirement is typical for a hard career game. 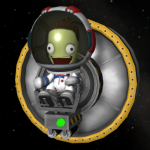 My attempt so far: 6483 funds for 4 Kerbals. Re-entry. The open service is used to stabilize the flight, and the empty fuel tank serves as makeshift heat shield. Is this caveman Bonus only for using tier 4 parts, or also for weight and size restrictions? Here's my entry for the disposable category. Perhaps not surprisingly, it looks a lot like @TheFlyingKerman's entry, and I admit to shamelessly stealing the service-bay-as-airbrake trick from them. My version is slightly cheaper and more primitive, though. It costs 5,985 kerbucks, seats four passengers and qualifies for the -10% caveman bonus due to only using parts from tier 4 and below. Thus, its total discounted per-passenger cost works out to 0.9 * 5985 / 4 = 1346.625. The first stage is attached to the launch clamp with a slight westward tilt, and looks as if it should be launching retrograde. 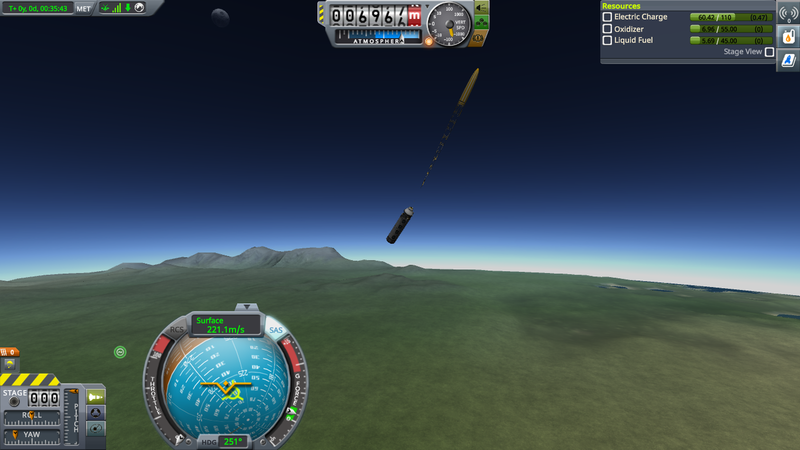 In fact, the combination of its slightly unstable aerodynamics and the shifting center of gravity during the first stage burn instead cause it to execute a really neat mid-air turn and head eastwards at a roughly 50 degree pitch, which is just about perfect for the launch profile this craft needs. 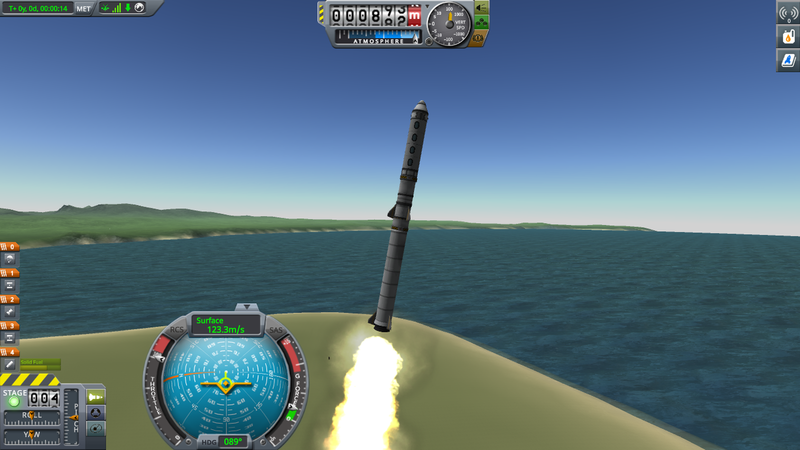 I wish I could say I designed the craft to launch like this on purpose, but to be honest, it just happened by chance and I decided to go with it. The piloting is done by a Stayputnik probe code hidden inside the service bay and the nose cone. However, there's actually not much piloting to do, since the ascent and re-entry are almost entirely hands-off. Indeed, the first stage and the re-entry stage have no active attitude control whatsoever(! ), and the second stage only has the gimbaled Terrier engine to steer with. All you need to do is launch with SAS off and throttle at max, stage when the SRB burns out, keep burning until your apoapsis is between 70 to 80 km, throttle down, coast to apoapsis and circularize. If you do the coasting under physics warp, the craft will even maintain a prograde heading automatically. To return from orbit, turn retrograde, burn the remaining fuel (which should drop your periapsis down to about 50 km), open the service bay and stage. 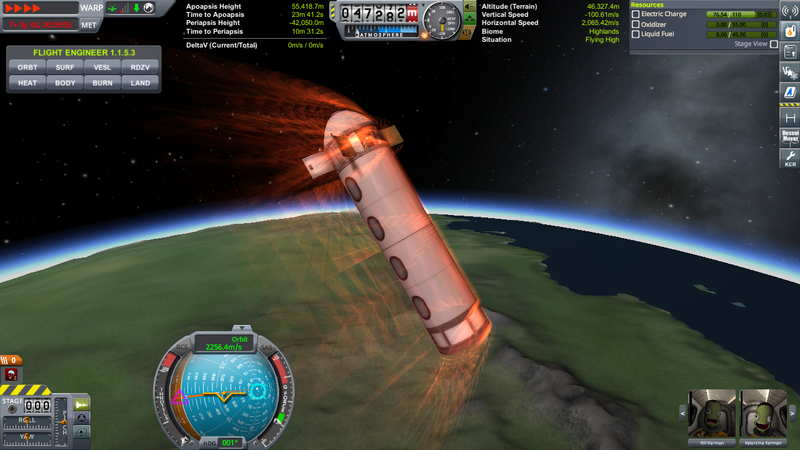 Note that the craft has no RCS or reaction wheels, so you need to throttle up slightly to steer. Or you can just timewarp until you're pointing retrograde anyway. 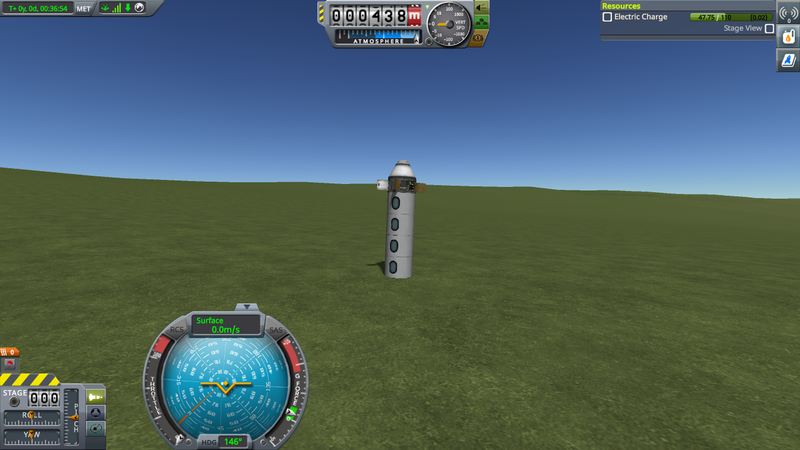 If you forgot to open the bay before staging (like I did ), do it afterwards and manually deploy the parachutes. The craft will naturally turn sideways in the atmosphere (and tumble in a way that will surely thrill the passengers, or possibly make them airsick), and the chutes should semi-deploy automatically around 11 km. There's a couple of potential ways to reduce the cost further. One is that the battery inside the service bay is technically not necessary if you're really agressive with hibernation and only turn the Stayputnik on when you absolutely need it (i.e. for staging and orbital maneuvers). You can't stay very long in orbit if you do that, though, since even hibernation still consumes some power and the Stayputnik only has 10 units of it. Another option I considered was replacing the first stage decoupler with a cheap girder segment and using overheat staging. While this works fine as far as the staging goes, and saves almost 400 kerbucks, it unfortunately also messes up my elegant and efficient launch maneuver. I'm not sure if it's the changed aerodynamics due to having a 0.625m part in the middle of the stack or what, but I just couldn't get it to work properly no matter what. There is no weight and size restrictions, because there is already restriction on part count. @vyznev Very good. I won't be able to build this because I don't know how to steer with just gimbal. There's a couple of potential ways to reduce the cost further. One is that the battery inside the service bay is technically not necessary if you're really agressive with hibernation and only turn the Stayputnik on when you absolutely need it (i.e. for staging and orbital maneuvers). How about a bigger rocket? The Hitchhiker can is 90 points and is allowed. TBH, it's not hard. It just means that you need to throttle up if you want to steer. But you don't need to throttle up much, usually just the tiniest nudge of the Shift key is enough get you some steering control. If you really want to conserve fuel, you can even cut the throttle again once you have the vessel rotating, and just let it rotate until it's facing the way you want (or until you realize that it's rotating the wrong way and you need to make a correction...). 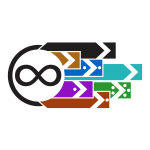 Come to think of it, that would make a neat micro-challenge: launch and dock two vessels in orbit using no reaction wheels or RCS. It's definitely doable. I'll go and suggest it. Let me throw in the first SSTO. You asked for tier 6 or 5 with bonus. What if I do it on tier 4? Or is there a tier 4 bonus? Thanks for the hint, but that challenge only accepts horizontal takeoff and landing. Also I'm above the weight limit. Thanks for the hint, but that challenge only accepts vertical takeoff and landing. Also I'm above the weight limit. Yes, but I had corrected this an hour before you quoted it. How did this work? I studied your album but still haven't figured out how did you managed to fly the craft precisely over the runway. 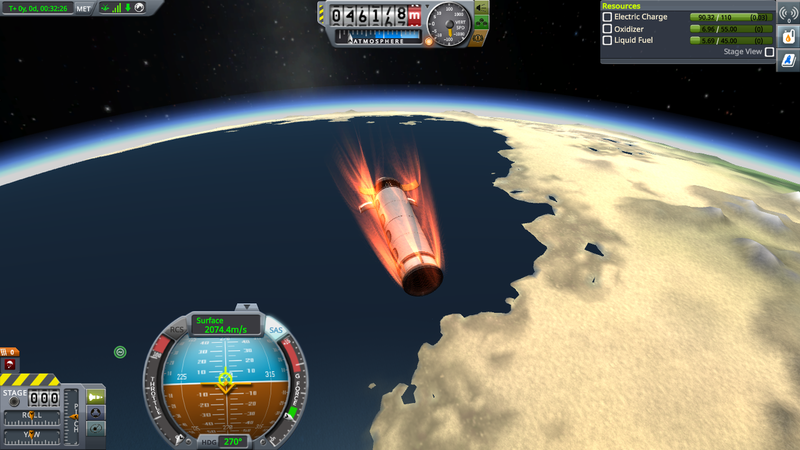 I have a similar ssto (but for cargo, not this challenge). The wings of the craft is so small that maneuverability must be very limited. But they can't generate a lot of lift, and if you try to turn, it bleeds a lot of velocity. For instance, how did you correct for over/under-shooting? That's why I would not try to land it on wheels. But if you look at the picture where I approach the runway, you see in the navball that it flies surprisingly well. I also adjust the control surface authority for every phase of flight, to have more or less aoa. Also wings become much more efficient when the com col is correct. Com too far in front forces the control surfaces to generate drag instead of lift, or even downforce depending on wether they are in front or behind com.